It's no secret that I'm a Francophile at heart. Therefore, it is inevitable that I should prefer French clothes, bags, shoes, scarves, fragrance and patisseries. Ever since I've taken my first whiff of Geodesis scented candles, I was hooked. I wasn't keen on having to light up or distinguish a candle so the next best thing was their reed diffuser. 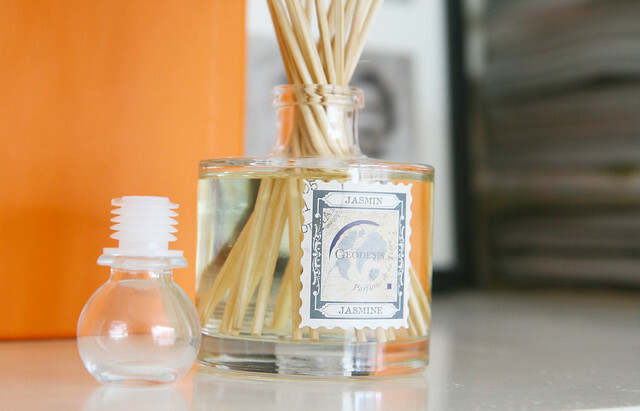 I've got the Jasmine in my lounge and my favorite, Rose which the aromatic Orange Blossom undertone in my bedroom. 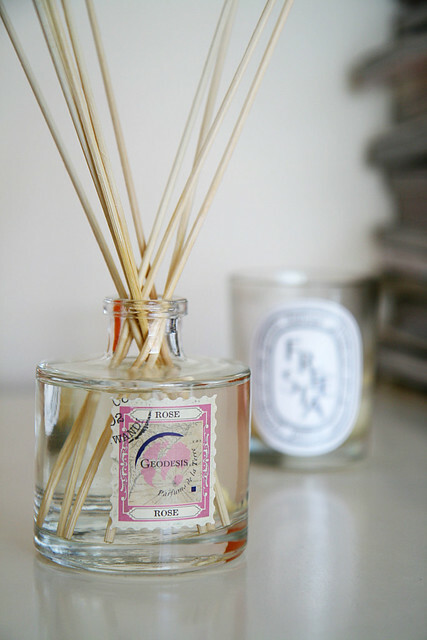 Geodesis reed diffusers are very concentrated so I'd recommend that you use half of the reeds provided. I beg my family to fit as many boxes of Stassen Jasmine tea whenever they come over to England. They're ridiculously affordable but have an exquisite Jasmine fragrant and taste just as delicious. This is the most requested drink from friends when they come visiting. I'm loving this lightly scented shower gel and lotion set from Ren. While their courier delivery leaves something to be desired, I can't fault their products. The fragrance isn't overpowering. The essential oils used in both products leave the skin moisturized. 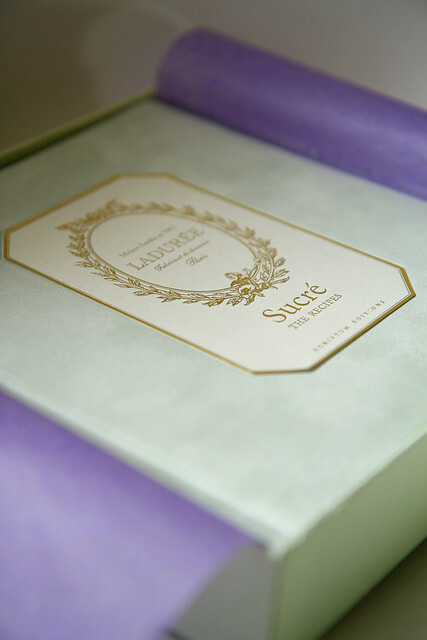 Beautifully presented with gold sleeved edges, this velveteen hard cover book by Laduree is a work of art. It took me two months of waiting before Amazon finally delivered this book. While technically, it's not a fragrance but I can imagine the delicious scents from the delicate macarons wafting from the pages of the book. Oh... 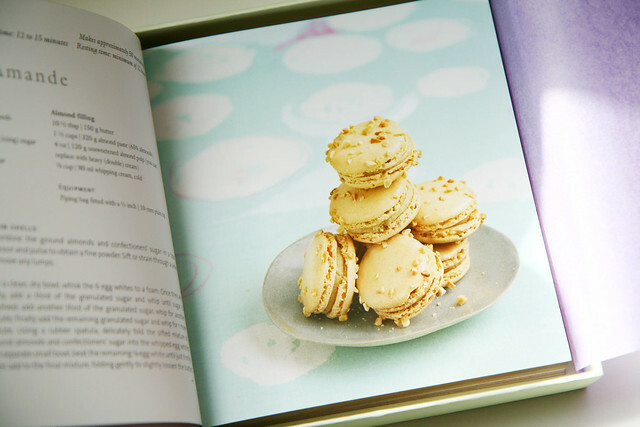 I need the Laduree book now! and the Jasmine tea looks yummy. I'll be sure to give it a try. Have a good weekend! I really need a scent diffuser in my place, it's lent and I have some neighbors who are cooking/frying fish in the highrise...yup not pleasant to smell fish at 8pm! I love Jasmine tea but have yet to find the finest one. Yours looks heavenly, i want a sip or two. Still havent tried macarons up to date...sigh. Your post makes me want to have an aftrrnoon tea. It is in my to do list when visiting my parents to go to a hotel for some fine afternoon tea. Yout tea set is so pretty too. What a yummy post...! 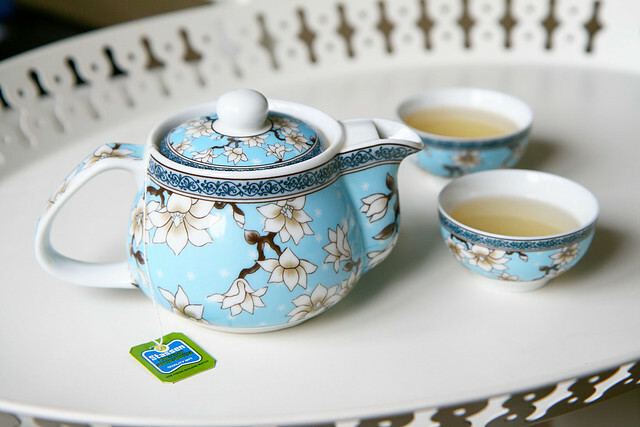 Especially love your jasmine tea (need to hunt down some) and your tea set (pretty color!). Have you ever tried the tea-scented candles at Mariage Freres? Lovely, lovely! From one Francophile to another! And Jasmine tea is my very favorite, too! I get organic Jasmine Pearl tea from a sweet little shop in town. Will have to send you some! I've only recently starting drinking Jasmine tea at home. Must look into Stassen since it gets such high marks from you. i've heard of the baies/dyptique candles but not that brand. sounds super nice. must check it out. i'll be doing a post on tea soon, so this is good to know (can i get it in the US?). excellent post M.